The Indian Air Force (IAF) is set to bestow the honorary rank of a Group Captain on cricketing great Sachin Tendulkar in recognition of his outstanding achievements as a sportsperson. Honorary ranks in the Air Force are traditionally given to people who have made outstanding achievements at the national level especially those linked to the aviation sector. Among those who have been given similar honorary ranks in Air Force are JRD Tata and Vijayapat Singhania. Both Tata and Singhania were awarded the honorary ranks of Air Commodore. 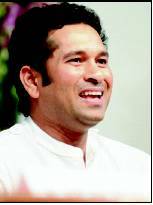 A senior Air Force officer said the IAF headquarters has decided to give Tendulkar the honorary rank of Group Captain. "We are awaiting the government approval," he said. Once the proposal is approved, Tendulkar would be formally accepted as a member of the Air Force family, but he would have no official responsibilities with the IAF. The senior IAF officer said several eminent persons of national standing have been given the honorary rank over the years. Inducting such leaders also helps in adding to the morale of the force, he said. Indian military has a tradition of inducting outstanding individuals as honorary officers into its ranks. Recently, cricketer Kapil Dev and southern film star Mohanlal were inducted as honourary Lieutenant Colonels in the Territorial Army. Tendulkar's selection by the IAF is a slight departure from Air Force's tradition. Usually, it has given the honorary rank to people who have had some role in the aviation sector. "But there is no such hard and fast rule," the officer said. JRD Tata had obtained the first pilot licence issued in India and later started Air India. Singhania, chairman emeritus of the Raymond group, holds several world records in hot air balloon and microlight flying.